I found a small amount of this Apache Agate at Tannehill earlier this year. 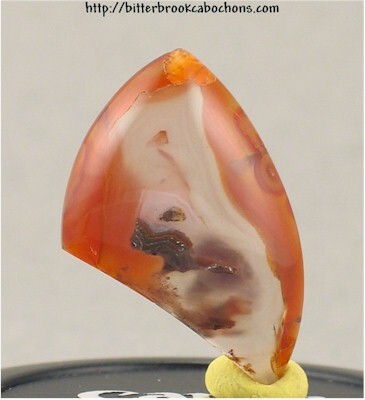 This cabochon has a pattern that looks to me like an angry duck ("baby chick," my wife says). Anyway, there is a chip on the back edge halfway along the bottom edge, that cannot be seen from the front. 32mm x 22mm x 6mm (as oriented in photo). Weight: 25.45 carats. 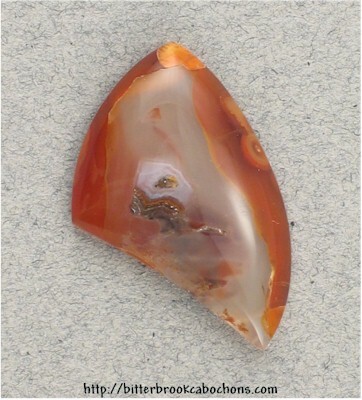 Click on the images below to see the cabochon super-sized.